The China-Pakistan Economic Corridor (CPEC) is one of the first initiatives conceived and implemented that reflects the objectives and tools for implementing the "One Belt, One Road" initiative proposed by Chinese President Xi Jinping. During Xi's visit to the country earlier this year, Beijing revealed that it will invest $46 billion in Pakistan to propel the project. How to ensure the project progress smoothly and successfully? Will this project set an example of how to participate in the "One Belt, One Road" initiative? Global Times (GT) reporter Yu Jincui talked to Pakistan Finance Minister Ishaq Dar (Dar) over these issues. GT: China and Pakistan are working together to build the CPEC. Can you give us some insights on this project? Dar: The CPEC is a mega project of the "One Belt, One Road" initiative, comprising a cluster of communication networks, energy and infrastructure projects. Projects for over $46 billion have been finalized so far by the two sides. In order to meet the power needs of Pakistan, and to augment its available public power generation facilities, the bulk of the money will be put into energy projects and it is important to encourage power generation through private investment. Once completed, the corridor will be a concrete testimony to the huge economic dividends that regional connectivity and integration entails. We have agreed on major infrastructure development projects that will link our two countries through a land route, and our region to Central Asia, Middle East and Europe through the sea and air routes. Not only Pakistan, but also China and other neighboring countries will benefit from the project. GT: Will militancy in Pakistan pose a threat to the CPEC as some analysts claim? Dar: The current government of Pakistan is deeply committed to developing the economy and eradicating terrorism and extremist sentiment from its soil. We have done quite well with the economy and it's acknowledged across the world that the Pakistani economy is developing in a very positive direction. Eradicating extremism and terrorism is one of our priorities. The present government has formulated the National Action Plan (NAP) with the consensus of other political parties to root out terrorism in all its forms and manifestations. The NAP is being implemented with full commitment and coordination with all stakeholders. The successful launching of operation Zarb-e-Azb in June 2014 and the Karachi Operation have created a visible impact and deterrence. As a result of the commitment of the federal government and law enforcement agencies (LEA), the overall law and order situation has improved significantly. There has been significant improvement in internal security. In LEA operations, a large number of terrorists have been killed or injured, explosive factories destroyed, safe heavens demolished and the terrorists are on the run. Similarly, the overall situation in Karachi has registered a visible improvement in terms of law and order. The present government is committed to combating terrorism, militancy and extremism until its logical conclusion. The Pakistani government is determined to ensure the safety of Chinese nationals deployed on each and every CPEC project. We intend to provide full security to all of the economic corridor's projects. GT: There are many outside concerns around the CPEC. For example, India has reacted strongly to the CPEC, with Prime Minister Modi terming the project "unacceptable." How do you view India's reaction? Dar: India's reaction is unnecessary. I would say it's an intervention in our internal affairs. We have tried to promote connectivity and reach out to all the neighboring countries. We believe that we need peace in the entire region. We believe countries including Afghanistan and India could also benefit from the economic corridor. India's reaction is surprising. Indian leaders and the parliament reacted sharply to the projects, but they should see the projects positively. It's good for India also. Greater regional connectivity and the CPEC will utterly benefit the whole region including India. It's an immature comment to say the project is unacceptable. GT: In your opinion, does the CPEC have some demonstrative effect to other countries as to how they can participate in the "One Belt, One Road" initiative China proposed? 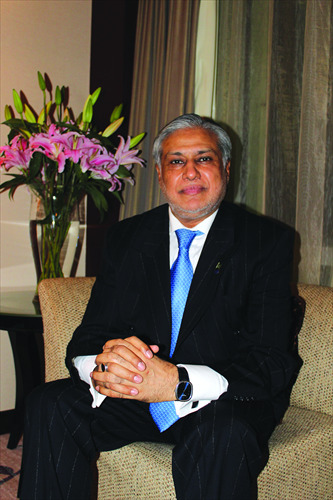 Dar: The CPEC is an important cooperation project which is part of the Silk Road project and hence it shall have a demonstrative effect for other countries involved in the initiative by successfully implementing the development of the project in a manner that actually brings a win-win situation for all stakeholders. It puts lots of pressure on both Pakistan and China to build peace, harmony and development in the region based on the foundations of their close friendship. We shall make our best efforts and continue our hard work to realize this grand dream. The success of this project shall not only become the benchmark for other countries, but shall in fact become the cornerstone. The project acts as a model for regional connectivity and prosperity for all other countries of the world to emulate.